Reception on a Gibertini 1.0 m in Landeck, Tyrol, but nothing on a 1.5 m in Wernberg, Villach. A well-installed 3 metre dish receives nothing in Graz, in the south-east. We live next to Lake Millstatt (north of Villach) in the south of Austria. All previous perfect signal on 1.2 metre into Humax Foxsat has now gone - even radio. So now its all done over the internet. Let’s face it, that’s probably the future anyway. Seems to me that UK TV not cashing in by selling their programs to millions of Brits around the world is incredibly short sighted !! I just wanted to drop you a quick mail to inform you about my current situation regarding the reception of BBC channels in Austria after the move to Astra 2E. I've got a 1.0m dish and a PACE digi-box. Used to have great reception, after the move, none whatsoever for BBC channels. I may try out bigger dishes soon and will report back if I do. I am living in Tyrol, about 60km east of Innsbruck (near the German border). Dishes of 2.4 to 3.2 now necessary. In Gran Canaria, a good quality, and expensive, 2.4 m ChannelMaster type is needed with a top quality LNB, but it seems this is too small in Tenerife. 3.1 m working in Lanzarote, as well as a 3 m in Adeje, Tenerife. 5 metres in Tenerife. We have started getting more channels in the past few days I am guessing around 120 more, I don't think we are receiving them from Astra 2A though I believe we are getting them from 2E European beam as we can not get Astra 2A North. I think this because ITV 2HD, ITV3Hd and ITV4 HD are now receivable here now and they were on Astra 2A north beam before, Since yesterday we can now get them so I am assuming they are now on 2E European beam. The centre of Denmark is now an Astra 2E "black hole", where there is virtually no signal. It is on a "null", which extends the length of the country. The west coast of Sweden is also affected. Large scale losses from the southernmost quarter of the country. Typically dishes have been 80-90cm in the past. In some areas, a re-tune and a better LNB will get the signals back, but with little rain margin. A 120cm. may be needed in many areas. Near the border with Catalunya, the signal is worse. 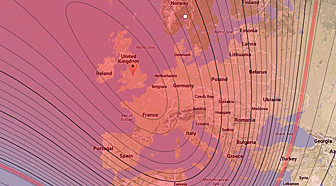 There is a report of a well-tuned 90 cm retaining the BBC between Cannes and Nice, but many reports of BBC loss in the region, roughly in a line drawn eastwards and westwards north of Toulouse. Planning regulations in many areas restrict dish sizes to 1 metre. 85 cm in Grenoble, with a Humax receiver. Location Castillon du Gard, near Nimes & Avignon, S of France Dish: 95cm LNB: Zinwell octal claimed to be 0.2dB Pace Skybox, Samsung Skybox & Sagem Freesat All channels present and correct. Default xponder signal on Pace - same signal bars as last week Default xponder signal on Samsung - same signal bars as last week Sagem signal BBC1,2,3,4 was Quality 100% Strength 68% on Wed 5th is Quality 100% Strength 64% on Thurs 6th BBC1,2 HD was Quality 100% Strength 76% on Wed 5th is Quality 100% Strength 68% on Thurs 6th However, I notice large fluctuations in strength and some in quality today despite clear weather, so I'd like to see things settle before I'm convinced. After severe mistral last November, I did a quick fix peaking of the dish and I aim to do it very carefully when things are settled, so I'd expect some improvement. I currently have little rain margin on ITV HD, esp when heavy. Also the offset dish is 13 years old and was shipped to France 4 yrs ago after use in England. It has to be warped by now, so I'll be aiming to renew with one of appropriate size when SES have stopped tweaking the lobes. BBC channels have disappeared most parts of Germany on the dishes typically installed for Astra 2. Previously, 60 to 90cm dishes were sufficient. Dishes of around 120cm may now be needed. This is guesswork, no-one needed dishes this big before. North of Hamburg, the signal weakens. Not far to the north, some parts of Denmark have virtually no signal. To the south, near the Austrian border, 2.4 metre dishes are now needed. Just one report, from Lindos, Rhodes, 2.4m with petals, extended to 3.2m, 100% working on BBC. Some other Sky channels patchy. Using Sky receivers. This report is highly surprising, confounding predictions. No BBC for most in the centre and south. Between this area and Rome, 1.8 to 2.5 metres. Further south, in Potenza, Basilicata (well south of Rome, 40.38N 15.48E), a 3.4 metre (11 feet) Prodelin dish is just about receiving the the 2E UK Spot beam. I confirm that we too have a much better signal just slightly to the south of Modena City, in the countryside. Daytime, we receive BBC1 and 2 in HD. Standard definition BBC, ITV and C4 channels ran through all last night , 80% signal 60% quality. This on the Freesat box, the old Panasonic SKY box remains pretty much useless on FTA. BBC signals have disappeared on 1.2 m dishes, which 90% of expats have. 1.8 m is the new minimum. Only 2.4 m Skyware dishes (formerly ChannelMaster) give good rain margin. To confirm we now have lost all ITV & CH4 as expected on 1.3m dish in Menorca. You said a 1.8 plus dish would restore signal but I suspect the cost would be 1500 euro at least. When I ask myself if it worth it, I think not. Still have lots of other channels to watch plus SKY news. Just to keep you informed. As of 07:00 today, no BBC receivable on the normal 1.25m dishes that 90% of expats in Menorca have. 1.5m still ok at this time and in this 100% clear weather, but we have found that around 09:00 is the weakest time so am expecting problems with the 1.5s later. Of course anything larger than those two dishes are ok at the moment and again with clear skies. From measurements it appears that 2E is exactly the same as 2F in Menorca, so 1.2, 1.5 will be too small . 1.8m will be ok in clear weather and the 2.3m prime focus famaval and the 2.4m offset skyware will be the best option for all year watching I will keep you informed over the day and different weather. Hi. I am receiving all the channels that moved in the last few days here in Binibeca Menorca using a 1.5 m dish and Humax h.d. box. Only problem seems to be when it rains heavily. Tunisia and Tangiers, loss of BBC on 2 metre dishes. Perhaps surprisingly, the BBC was easy to receive in N. Africa. Dishes of 90cm used to be OK in the south, but not now. Upgrades to 120cm may be needed. Current set up: 120cm dish (used to work fine) Location: Bergen, Norway We used have everything, but of course BBC was lost on Thursday night with the move. We live in the south of Norway in Lillesand (30km north of Kristiansand) and have a humax freesat box and a 90 cm Dish. We have lost all access to BBC channels. I have lost all BBC channels tonight. ITV and CH4 are still working. We have an 86cm dish. A 1.0m dish has lost BBC near the German border, 100km east from Berlin. Writing to You from western Poland 40 km from Polish-German border (100km east from Berlin) Just lost all BBC channels, signal is 0. Will try to readjust the dish in next couple of days but I do not have hope I will get it back. Installation - 100cm dish, Panasonic TV build in freesat tuner, also another one Goodmans SD tuner - on both of them BBC is gone. From the centre of the country southwards, little or no signal is being received on dishes of 3 metres. In Coimbra, a 1.5 m will give a just-about adequate signal with no rain margin. In Villa Real, in the north, 1.8 m works OK. The Algarve is a BBC disaster zone. Nothing on any size dish, even 3 metres and up. BBC channels all lost on Thursday morning. Still have ITV and Channel 4 this morning - 07.02.14. All Channel 5's lost some time ago. Many very upset ex-pats around here, mostly retired and UK TV is a lifeline. It all seems very unfair, why couldn't the footprint have been left as before? We are using a 120 dish and have lost all bbc's at the moment. A friend has had a system put in a few months ago that use the old dish pointing at astra for sky channels and another 120 dish pointing in almost the opposite direction and a Technomate-5400 receiver. She can pick up BBC channels and ITV ones. I looked today and when she is on BBC 1 it shows 34.0w TF-Sat 11.495v 44.102 any idea which satellite this is and is it an alternative? She does NOT pay any monthly payment. reception reports from my clients here in Central Portugal: out of 27 clients with various size dishes (1m- 3.2m) only 4 have kept all the `lost` channels. 1st one is on the lower south side of the Caramulo mountain with a 1.8m dish 2nd one is south facing in Santa Ovaia near Olivera d Hospital with a 1.4m dish both have good line of site and are quite high in ground elevation. 3rd is in Carregal d Sal south facing on a hill with a 2.1m dish 4th one is near Viseu and has a 2m dish other clients around Penacova, Coimbra , Santa Comba Dao and Tondela have 2.8m dishes with high powered LNB`s that they installed ready for the switchover. They too have lost the channels. to clarify ..out of the people i know , the ones who still have all channels are all higher up than the others. there are a few folks with 1.8+m dishes who seem to be getting intermittent signals, But lets face it , the weather at the moment is not great for figuring out signal strength. so.....as I and others stated many many weeks if not months ago: It all depends on your location as well as dish size. In, Prietrzka (100km N. of Bratislava, near the border with the Czech Republic), a 2.5m prime focus dish has very limited reception of the 2E UK spot. The lower third of the country has lost all BBC. Dishes of 3 metres are receiving no signal in Costa Del Sol. Most dishes in the Málaga region are 1.2m (1.3m vertically) which will just get the Europe beam used by Sky's pay channels. However, no BBC, ITV, Channel Four and associated channels will be received. If you have an Irish Sky card you will be able to watch C4, E4 More 4 Ireland. The only ITV channels which can be received are ITV 2,3,4 in HD as part of the Sky HD pack. 1 m in Oliva, Costa Blanca. Location: Just north of Huercal-Overa, Almeria Spain ( 37° 29’ N, 1° 56’W) Equipment: 1.6m dish (1.7m tall), Amstrad DRX890 2TB Sky+ HD box Reception: Varies during the day. In the morning CH4 and 5 are available, BBC1/2 a weak (can get a picture but it breaks up a bit) but can’t get ITV1. During the day (yesterday) all BBC channels were lost as well as CH4 and CH5 (but CH5 HD ok). However, after 10pm I was getting a good signal on BBC 1 & 2 (SD), ITV (SD), CH4 (inc CH4 HD) and CH5. Also I can now get ALL Sky movies channels (never been possible to get all since we came to Spain 4 years ago). I have checked all my channels this morning and have lost none that I can see. I am at Rojales on the edge of Quesada, Alicante province. I have a self installed 1.8 off set Channel Master dish (I am a retired TV engineer) using a Humax (foxsat hdr) freesat rx. At the moment we have heavy cloud cover but no rain, it will be interesting to see what happens when it does rain. Whilst I am aware of the forthcoming loss of the ITV, BBC, 5 and and channel 4 programmes, I would like to know why, and by whom, was the decision taken to take such action. Bearing in mind that the size of the ex-pat population here in Spain alone has to exceed, or at the very least be approaching the 1 million mark, was the decision based purely on the desire to improve the signal to the UK, if so to what or who’s advantage, or was it a “political” decision based upon the somewhat not too smooth political relationship between the UK and Spain. I realise that this change affects other countries in Europe, which makes it all the more difficult to understand. Talking to a few of the Spanish people here in the village, they watch UK TV via freesat because the programmes are in general better than the home grown ones and they get better news coverage. they are not happy with the changes being made at all! Losses on 1.2 m dishes, but this size may be OK in Gothenburg. 1.5 to 1.8 m may be needed in most parts of the country. I live in Lundsbrunn, Sweden, this is located on the E20 between Göteborg and Stockholm *below lake Vänern*. I read on your site that the reception saw almost no change in Southern Norway and the signal gets weaker above Stockholm, I am lower than Oslo and yet I lost all BBC. I can just about receive the 2f UK beam (with very minor pixelation during the day otherwise a good reception) but the 2e spotbeam is a lot weaker here. ...I think in Gothenburg you would get away with a 1.2m dish as the very minimum for 2e. It's too early to say whether signal strength on the new satellite has increased, it may just a result of drier weather in some places. More reports of improved 2E reception have arrived. In Fredrikstad, Norway, a 1m Nokia dish has the BBC again, as does a 120cm in Mazarrón, Spain, a 125cm in Modena, Northern Italy, and 1 metre dishes in Horadada, South Costa Blanca and Lake Garda in northern Italy.